Salmon is also found in some pet food. The ethical issues in their supply chain are slightly different, so they will be covered separately, as will a couple of other products. The ethical issues in wild-caught and farmed salmon are quite different, so I will treat them separately. In terms of farmed salmon, I will mostly deal with that farmed in New Zealand as that dominates the market here. Any tinned salmon is likely to be wild-caught; some packaged fillets and ready-meals are also wild-caught. Alaskan salmon is caught in Bristol Bay - incidentally, the same salmon population that feeds the bears in Katmai National Park :-). Salmon-fishing boats are restricted by law to no more than 32 feet in length. Working on them is clearly tough, but it seems to be work that people are freely choosing and, indeed, work that people encourage their friends and relatives into as the pay can be very good. I found no evidence of forced labour and also think forced labour would be hard to manage in this context: the fishing season is short and afterwards you'd need to find something else for the people you had coerced into working to do. The fish is then generally processed locally. There have been some allegations of unsafe working conditions in factories - and the hours people work are phenomenal - but many people also speak of enjoying the stunning location and the impressive money you can make. Even the minimum wage really adds up when you're working 16 hour days and getting time and half for overtime! Many people choose to come back year after year and encourage others to join them. I found no evidence of forced labour. Much of the workforce is migrants, with Puerto Ricans dominating. British Columbian salmon is caught in the Skeena watershed. As with Alaskan salmon, it is caught from small boats. There are some safety concerns, but no forced or child labour concerns: these seem to be desirable jobs. And again, the factory processing jobs seem to be hard yakka but freely chosen. Conditions for the US Pacific North-West seem similar. I believe you can buy wild-caught North American salmon in complete confidence - so long as it was also processed locally. It won't be supporting development in low income countries much (although it will help Puerto Rico), but you won't be supporting child or forced labour either. You do need to check that it is processed locally, however. Sometimes it is frozen then shipped to Asia for processing, and those factories sometimes use child and/or forced labour. If it's not on my list and it doesn't specify on the packaging that it was both caught and processed in Alaska then I'd advise you to contact the company for more information. John West: All their salmon products - both those that say 'wild caught Alaskan salmon' and those that don't - are wild caught in North America and canned locally there. They sell tinned pink salmon in a wide variety of flavours, tinned red salmon, salmon slices and salmon-based ready-to-eat meals. Note that there is a 'John West' brand in Europe that is owned by a different company from that which owns the 'John West' brand in Australia and New Zealand: I have no idea of the provenance of their salmon. Sealord: Again, all their salmon products - both those that say 'wild caught Alaskan salmon' and those that don't - are wild caught in North America and canned locally there. They also regularly visit the canneries, which are also independently audited for good labour practices. Sealord sells tinned pink salmon in a wide variety of flavours, tinned red salmon and plastic 'pockets' of flavoured salmon. Sealord deserves a special mention as their Public Affairs and Communications Manager has been extremely helpful to me in this project. She has been very generous with her time, answering a large number of questions from me. It has been clear from the information she has given me that Sealord has a deep commitment to ensuring human rights are protected throughout the supply chain. Pams: I don't know where any Pams salmon is canned and I don't know where the salmon that isn't explicitly marked as 'Alaskan' is caught. All they were willing to say to me is: "All of our suppliers are expected to adhere to robust food safety standards and the relevant legislation, including labour laws, in place in either New Zealand or their country of business." I won't be buying Pams salmon. Countdown Select: Most of their tinned salmon is caught and processed in Alaska and hence is slave and child labour free. However, their 95g tins contain salmon caught in Alaska but processed in Thailand. They didn't answer my questions about working conditions at the factory/factories they use in Thailand (some are fine but some very much use child and/or forced labour), however, I've since found information on their website that has led me to believe they can be bought in confidence. Countdown's 2020 strategy states "We have an ethical sourcing policy which we expect all our suppliers to adhere to. Alongside Woolworths in Australia, we audit own brand factories based on considerations such as human rights and labour practices. We will build on our audit and compliance practice to ensure our supply chain accords with global best practice." As we can be confident of good labour conditions in the catching of this salmon, I think the above statement is good enough. The factory itself is the primary area of concern (not the upstream supply chain), and it is apparently audited for human rights and labour practices. In addition, by processing this portion of their salmon range in Thailand, Countdown is providing employment in a low income country, which is great. Countdown Select does plain tinned salmon, as well as salmon in 'smoke', 'lemon and pepper' and 'tomato and onion' flavours. I have not come across any wild-caught salmon from either the Russian Far East or Japan being sold in New Zealand. However, I will cover these briefly in case someone else finds some (in which case, please tell me!) or in case it is of use to international readers. There have been a significant number of cases of human trafficking and forced labour in the fishing industry in the Russian Far East, both on boats and in processing factories. I would not buy salmon from Russia unless the company was able to assure me that independent third parties had found these abuses were not occurring in their supply chain. I wasn't able to find any information about the Japanese salmon industry, so have no idea whether or not it is OK. I expect it is likely to be fine, so long as it employs local workers or foreigners on regular work visas. If any staff are members of the foreign "trainee" worker scheme there could be concerns: many such workers seem to have been somewhat deceived into their jobs and work for well below the minimum wage. I do not know if any of them work in the fishing industry but it would be worth asking about this (and about whether the processing is done locally or elsewhere in Asia) before buying. 'Fresh' salmon is likely to be farmed in New Zealand, as is any salmon marketed as 'King' or 'Chinook' or pushing New Zealand identity in the packaging. New Zealand is a country with strong worker rights, and salmon farms are situated either on land or close in-shore, so are easily accessed by labour inspectors. I do not expect to find cases of forced labour or child labour in salmon farms themselves. However, all salmon farmed in New Zealand is fed on fish meal, and some of this comes from locations where severe abuse occurs. Therefore, the key question here is: what were the fish fed on. I don't think many people are asking this, as I have clearly confused several suppliers with this question! The next largest supplier globally is the EU, which is also highly regulated: I have no concerns there. However, there are significant slavery concerns with one of the other major suppliers, Thailand. I would want to carefully check any fish meal or oil from Thailand, as well as probably any from Viet Nam or China, before having confidence in them. Neither Akaroa nor Aoraki/Mt. Cook knew where their supplier sources their fish meal, which was a bit disappointing. However, it turns out that the company that supplies both, Ridley, is at least somewhat aware of the issues. They have a policy of "not sourcing raw materials from suppliers which have been linked to the use of slave or child labour (or any contravention of human right laws). Wherever possible this is confirmed by third-party audit of the suppliers operations." I'm not quite sure what that means and they have yet to answer my follow-up question. If I hear back from them I may be able to transfer them to my 'slave free' list depending on what they say, but for the moment I'm not confident of them. New Zealand King Salmon (which produces the brands Regal, Southern Ocean and Ora King) is very aware of the human rights issues in fish meal sourcing. They only buy from suppliers that have BAP certification, which means they are subject to unannounced third party audits to check many things, including worker rights. Currently they source the bulk of their feed from Peru, with the balance being from the EU. Their major supplier is Skretting: 90% of Skretting's suppliers have signed a code of conduct that not only commits them to eliminating child and forced labour, but includes a number of other important human rights provisions. They are actively working to push this up to 100%. I would be delighted to buy NZ King Salmon's products as they clearly have a strong commitment in this area and have been extremely responsive to my enquiries. Sanford currently buys all their feed from Skretting, so I am happy to buy from Sanford. I am a little less confident of them than NZ King Salmon as they haven't made ongoing commitments to buy feed from suppliers with particular certifications. Currently (2018) they are fine, but they may not continue to be so into the future. If you purchase salmon from the fish counter in Countdown supermarkets, that salmon will have either come from New Zealand King Salmon or from Huon (discussed below) in Tasmania. Any of these products are likely to be child and slave labour free, and to be giving jobs to people in low income countries - they are all fine to buy. If you are purchasing salmon from the fish counter of one on the major supermarkets and have a choice of which one to buy from, I recommend you choose Countdown. 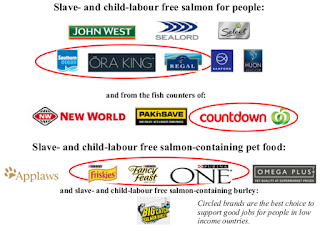 Currently, salmon from any of them are child and slave labour free; however, Countdown have made a commitment to try to eliminate labour abuses from their supply chain and told me they chose Huon and NZ King Salmon because they have made similar commitments. Salmon from them is thus likely to continue to be child and slave labour free into the future. Foodstuffs (i.e. PakNSave and New World) has made no such commitment so may well change to other suppliers with worse practices in the future; and similarly Sanford, one of their current suppliers, has made no worker-rights commitments and could at any time change to suppliers with worse practices. Note that there have been some environmental concerns about New Zealand farmed salmon, especially in the regions where Sanford and New Zealand King Salmon farm (Stewart Island and the Marlborough Sounds, respectively). I am not, personally, greatly concerned about these. Forest and Bird has given them an E rating, but reading their full report it doesn't seem too bad to me - e.g. they state that the sea bottom would return to normal within 10 years of these operations ceasing, which I don't think is too bad. Salmon farmed overseas is usually labelled 'Atlantic salmon'; if it's packaged, it may also state on the ingredients list that it is farmed (and where). The vast majority of salmon farmed globally comes from two countries: Norway and Chile. I have not come across any worker abuse associated directly with Norwegian salmon farming (and don't really expect to, as the Norwegian industry is highly regulated and unionised). The situation is different in Chile, where worker abuse of various kinds (including in Norwegian companies operating in Chile) has been reported, although not actual forced or child labour. As with New Zealand farmed salmon, abuse can also occur in the fishing and processing of feed for the salmon. If you want to buy salmon farmed overseas and it comes from Chile, you'll need to ask about worker treatment in feed production (i.e. on the boats and in the feed mills) as well as on the farm; for Norwegian salmon only the first two of these are likely to be relevant. I have contacted two companies selling salmon farmed overseas: Ocean Blue (a brand of MaxFoods), which markets Norwegian salmon, and Huon Aquaculture, a company farming Atlantic salmon in Tasmania. Ocean Blue has not replied to my queries so I don't know whether or not their products are slave and child labour free. It is fairly likely that they are, as the EU does attempt to ban the import of products where forced labour has occurred, but I can't be sure without Ocean Blue publishing information or replying to my queries. Huon pointed out to me that they are GlobalG.A.P. certified, as you can see from their website. This is a certification that covers many agricultural products including from aquaculture; to obtain it, not only must the farm producing the goods be certified, but so must all of their suppliers (and hence all of their suppliers, etc.). The standard requires regular audits and is, itself, governed by the standard ISO17065, which certifies standards are robust and impartial. When sourcing fishmeal and fish oil, the fishery and the production of fishmeal and oil shall be in compliance with the laws and regulations of the country of production and the country of destination related to fisheries. That's pretty weak, but probably good enough in this instance. It would only guarantee that the product is free of child and slave labour if those things were illegal in the source country. However, given that forced labour is illegal in most of the main fishmeal producing countries (with the exception of China, which still allows 'reform through labour' for political prisoners); and that there are minimum working ages in all of them (although for some, such as Peru, those ages are younger than the ILO would like), that's probably OK. I'm OK with buying products from Huon. I don't know how widely they are available in New Zealand, but they are one of the suppliers for salmon from the fish counters in Countdown supermarkets. Note that I have since published a separate blog post on pet food with fish in it. A lot of cat food turns out to include salmon, as do a couple of brands of dog food. It is quite difficult for pet food brands to be confident of the provenance of their fish supplies as they generally use waste left over from human food production. It often arrives as scraps or even meal and it can be hard to know all the stages it has been through before arrival. It could be argued that it is good, from an environmental standpoint, that these products are used rather than wasted, so it doesn't really matter where it came from as at least it's being used. I have some sympathy for this argument, but still would prefer products to be made from the waste of more ethically caught fish if at all possible, as that increases the size of the ethical fish market. The majority of the brands I contacted to ask about the provenance of their salmon did not get back to me. I contacted Nestle (owner of the brands Purina, Fancy Feast and Friskies), Kraft Heinz Watties (owner of the brand Chef), Temptations, Dine, Applaws, Gourmet and Whiskas. Of these, only Nestle, Applaws and Kraft Heinz have replied so far. Yay for commitment, transparency and concrete action! In addition, activist Andy Hall tells me that Thai Union, the company that processes all fish used by Nestle in their pet food, has the best human rights practices of any Thai fish processing company. All that makes the Nestle brands my preferred choice: not only do they not (as far as can be ascertained) use child or slave labour in their pet food supply chain, but they are giving jobs to vulnerable poor people (mostly migrants from Cambodia, Myanmar, Laos and Viet Nam), and those jobs come with better working conditions than those in other fish factories. Go Nestle! Nestle make Purina, Fancy Feast and Friskies. I also heard back from Applaws, who make It's all good ocean fish and salmon cat food and Applaws dog food with salmon and kelp, both of which contain salmon meal. Applaws have an ethical policy that includes good "workforce rights" policies which are backed up by onsite visits either by their suppliers or by their parent company, MPM Products Ltd. It was not clear to me whether their workforce rights policies cover workers on boats, or whether they are just relevant to workers at processing facilities. However, for wild-caught salmon the dominant human rights issues occur in factories, rather than on boats, so I am happy to recommend Applaws' salmon-containing products. Kraft Heinz Watties (i.e. Chef), on the other hand, was most unsatisfactory. They told me that they source salmon "from various suppliers throughout New Zealand" and that "Kraft Heinz is an ethical company and adheres to all the employment regulations." That doesn't tell me anything about labour abuses occurring before the fish even arrives in New Zealand, which is where the bulk of the problems occur. I have asked them whether they do anything to check on conditions throughout their supply chain, and will update this if they come back with anything more. For the meantime I wouldn't buy Chef salmon-containing products (or any of their fish-containing products, for that matter, as I had asked about all of them in my email). New Zealand King Salmon (discussed above) also have a pet food brand, Omega Plus, made using the same highly ethical salmon they use for their human food :-) The Omega Plus range includes dog as well as cat food. There are a lot of multi-ingredient products that contain salmon (salmon-flavoured cream cheese, ready-made meals containing salmon, salmon sandwich spreads, fish cakes etc.). In general, these were the only salmon-containing product a particular brand made; I didn't email these brands as it would have been a lot of effort for not much gain. However, I did notice that Bird's Eye makes salmon-containing fish cakes. These are likely to be fine as Simplot (the owner of the Bird's Eye brand in Australasia) is a signatory to the Australasian Retailer and Supplier Pledge against Forced Labour. As part of this they have joined Sedex (a system that helps businesses trace goods through their supply chain) - so it's not just empty words. Phew! That's a lot to take in. But I've summarised the key information in this pdf that you can download and take with you when you shop.